Stock status is current as of 4/25/2019 8:19 PMET. Extend your power cord and angle the plug off to the side, so that it can sit flat against the wall and free up other outlets. 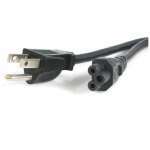 Save room around the office, maximize power outlet space, and extend the length of your bulky power cords. This flat extension cord lets you do all three. 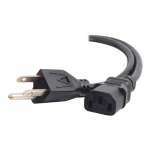 The low-profile extension cord has a right-angled NEMA 5-15 plug that sits flat against the wall. 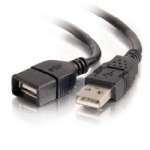 This lets you save clearance room when plugging in your device behind a cabinet, desk or other piece of furniture. You no longer need to push up against the plug so that your furniture isn't sticking off the wall. This avoids putting strain on the plug and protects it from damage. 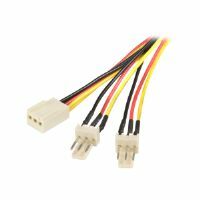 You can use it to extend any NEMA 5-15 power cord (computer, TV, office lamp, etc.) that needs to be plugged into a power outlet located behind a piece of furniture. 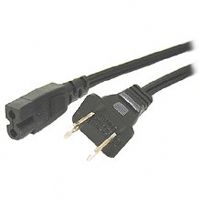 The right-angle power cord also lets you maximize the space on your power strip, surge protector or wall outlet. Since the plug sits to the right of the outlet, the outlet below it or above it isn't blocked which comes in handy when you have to plug in a device with a large, bulky power cord. 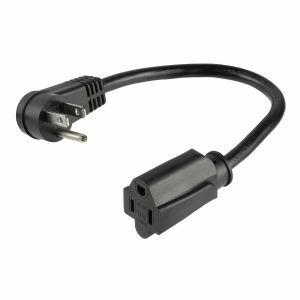 You can plug the bulky power cord into the receptacle of the extension cord and plug the right-angled plug into the outlet, freeing up another outlet that would have otherwise been blocked.